The Knox & Kane Railroad began operations after it acquired the right-of-way from the Baltimore and Ohio Railroad in 1982. The primary function of the railroad was to provide service between Knox in Clarion County and Kane and Mt. Jewett in McKean County. 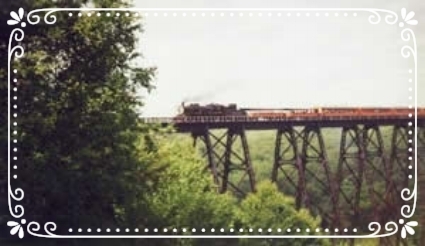 In addition to transporting freight, such as coal, the Knox & Kane Railroad ran a tourist operation from Marienville through Kane across the Viaduct at Kinzua Bridge State Park. 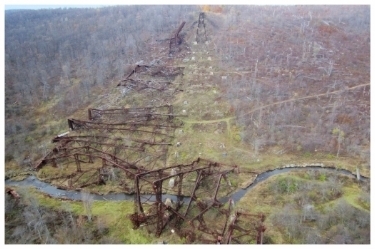 Although the tourism market became more important to the Knox & Kane Railroad as freight deliveries in the region decreased, the tourism operation suffered a fatal blow when a section of the Kinzua Viaduct was toppled by a tornado in 2003. The tourist train limped on into 2006, when it ceased operations due to lack of ridership. 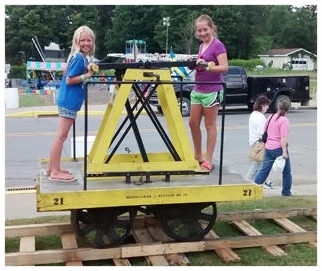 The Knox-Kane Railroad was sold at auction in 2008 to the Kovalchick Corporation, a steel scrap company based in Indiana, PA. In 2009, the Kovalchick Corporation filed for an abandonment exception of the railroad, and the Kovalchick Family Trust filed to rail-bank the corridor for interim trail use. The Knox & Kane Rail Road corridor was no longer being used, and it made sense to convert it into a rail-trail. The Knox Kane Feasibility Study was completed in August 2011. Click HERE to read a brief summary of the Knox & Kane Rail Road’s history. In 2015 the Mt Jewett to Kinzua Bridge Trail Club was established and eventually took a stand to Build the Trail and Save the Rails. 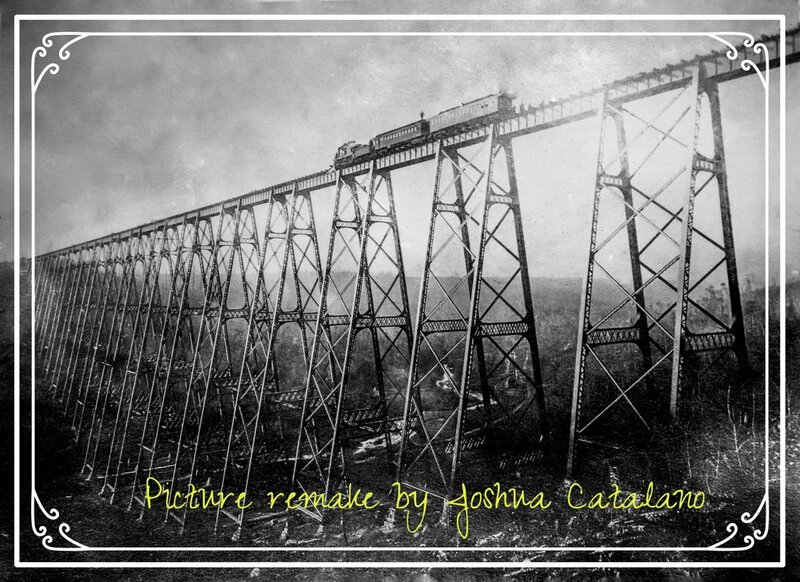 For two years the group advocated to save the rails and when finally given the chance to purchase a section of the abandoned railroad grade from Mr Kovalchick; the group fell short of the money needed to do so. See details in The Bradford Era. The MJ2KB T[Rail] Club was unable to convince the McKean County Commissioners, and other stake holders, the significance of keeping the rails on the corridor. Headwaters Charitable Trust completed the purchase of the corridor in 2017. Plans are now in the works for municipalities and trail groups along the corridor to develop and maintain the 74 mile Knox Kane Rail Trail that travels through four counties (Clarion, Forest, Elk & McKean). Today, the MJ2KB Trail Club (with over 40 members) will be stewards of the Knox & Kane Rail Trail from the Kinzua Bridge State Park to Mt Jewett (3.89 miles). We are also developing another section of the Knox & Kane Rail Trail from Mt Jewett to Lantz Corners (3.65 miles) Click HERE to see our progress along this section. Our club will be responsible for maintenance of both sections of trail. 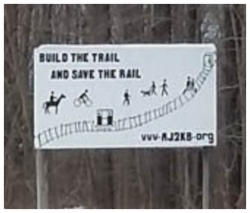 TAMED (Trail Association of the McKean-Elk Divide) will continue developing and maintaining the next section of rail trail to Russell City in Highland Township (see our PARTNERS page). Notice the man on top of the car above & the men hanging around in the other 2 pictures. Knox & Kane Rail-Trail under construction.